"Romantic suspense is her true forte. " Somewhere in the Australian outback, on land left to her by a late relative she never met, American photographer Erin Windsor believes a diamond mine might be waiting with the promised yield of millions of dollars in raw gems. But the old man took its location with him to the grave. And Erin’s not the only one in the hunt, thought she’s easily the least ruthless…and most vulnerable. Blood will stain the trail to a precious, well-hidden secret, and she must turn to Cole Blackburn for help or face the killing night alone. A geologist and a walking mystery with ties to powerful forces that are now Erin’s enemies, Cole is a dangerous man to trust, but she has no choice. Because life is too short to throw away your dreams, no matter how treacherous the pursuit of them might be. When I began writing THE DIAMOND TIGER (written under Ann Maxwell) in early 1990, the world was a very different place than it is now. Updating the book in the sense of bringing plot points into the 21st century was impossible. Too much has happened, from huge diamond finds in Canada to wrenching political changes around the world. I decided to leave the facts of the book intact—a snapshot of the diamond trade in the late 1980s. Yet things other than politics change through the years. Going through one of my favorite stories again gave me the chance to update some aspects of the story telling. 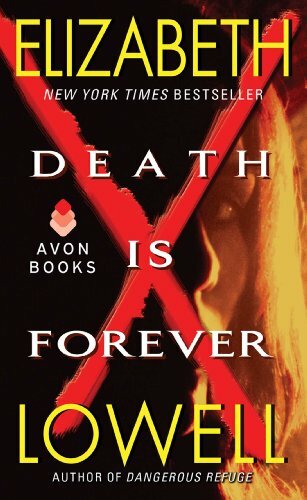 The result is a less formal, more colloquial novel: DEATH IS FOREVER. I hope you enjoy the reading as much as I did the creating.